Rents for quality residential accommodation is on the rise in India. Therefore, many people choose to buy property rather than renting one. Usually, the rent that one pays is roughly equal to an EMI that one would pay (in some places though rent may be lower…), if he chose to buy a property after taking a loan. But the latter would lead to building of an asset in the long term. So if you have decided to buy a property rather than renting one, then if you have enough disposable income, you are faced with two choices, to buy it with your own savings or to take a loan from a bank. But whatever you choose, it is extremely important to get a home insurance to protect your assets should you be faced with any unforeseen calamity. Different types of calamities are covered under home insurance like earthquakes, floods, fire, explosion, cyclones, lightening etc. Also covered under insurance are things like theft and burglary. These types of insurance not only cover the structure of the house but also its contents which are equally valuable. Different home insurers will assess the value of the damage done differently. But usually, Home Insurance assessment is based upon multiplying the area of the structure by the cost of construction. The value of the contents is ascertained by its current market price Depending on the type of home insurance policy you take, you get coverage for different kind of hazards. This is very important. Most housing loan companies have made it compulsory for any project to have building insurance before they sanction loan. Building insurance covers only the structure of the property. It insures the amount that you would need to reconstruct the house, in case damage is done to your property. As the name suggests content insurance only covers the things inside the house. This has become necessary due to the increasing rate of crime around us. The amount of money is assessed as per either how much it will cost to replace it or according to its current market value. It protects your valuables against fire, theft, accidental breakage, damaged caused to electric appliances due to electrical and mechanical breakdown. Then there are other insurance providers like ICICI Lombard. Since the policy offered by them is more comprehensive, so the premium to be paid is Rs 12600. On the other hand if your house is built on land and it costs Rs 4 crores, then the premium would be calculated depending on the area covered multiplied by its cost of construction. Value of land will not be included. Assuming that your house is 5000 sq.ft. and construction cost per sq. ft is Rs.2000. Then the value of your apartment for insurance purpose will be Rs.1 crore and not Rs. 4 crores. Premium for Rs. 1 crore will be Rs.5000 for 1 year. if you decide to get the contents of the house insured, then that will have to be added separately to ascertain the premium payable. The market for home insurance is on the rise as buyers are not only realizing the worth of getting insurance for their building but also its contents. Accel Partners Invests in company behind Techtree.com! Very nice article. Home is very essential asset and definitely no one wanna loose it in any case. 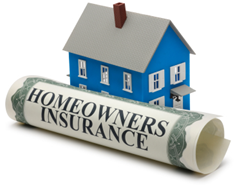 Insurance of home ensures to save the people toil cost and provide them a security to it. Home for a people is a reliable asset on which it depends for their resident. According to me, Insurance are of two types as mentioned here i.e building insurance and content insurance. Building insurance deals with the cost of entire home area and building cost of the home. The insurance assures full house cost backup to the person in case of natural disaster or other types of accident which damages the home. The content insurance deals with the contents inside the home like furniture, home assets, etc. The contents are insured against fire, accidental breakage or disaster, etc. The content insurance is done after inspecting the contents. The inspectors evaluate the content cost, which is given to the person as a recovery amount in case of accidents. Your home is such an important asset obviously you would never want to lose it in any condition. A home insurance saves not only the structure but even the content of your house like jewellery, electrical equipment etc. I am searching for the right home insurance plan for myself too. I recently came across this article on Royal Sundaram ( http://royalsundaram.weebly.com/ ) that talked about their plan in brief. Would like to know your take on it. That’s an excellent write up, really helpful. Lately, my father has been insisting me to invest in a home insurance plan. He has given me a list of companies that are leading providers in this sector. Of them all I really like the plans by Future Genrali as it includes cover for burglary / housebreaking and theft, protection of your valuables, protection of your electronic equipment and much more.